If you’re lucky enough to have some crafting time during the holidays, how about participating in the ODBD December challenge? We need 20 more participants in order to get 2 boxes sponsored! 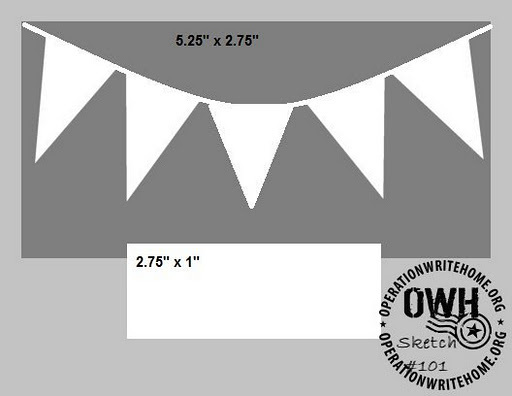 Here’s your sketch – thought we’d try something a little different this week, let’s stretch those crafty muscles, okay? Our sample card this week was made by cardmaker Donna. She isn’t a blogger so be sure and leave some comments for her here on this post. Aren’t those pennants darling? Thanks for the cute card, Donna! Oh my gosh, Donna, that is such a cute card! I love the bright colors and the font on the sentiment goes great with the pennants. Great job! What a fun sketch and a fabulous sample card too! I hope I can carve some timeout to give this one a try. Great card, Donna! I love the argyle DP you used for the pennants, and your sentiment font has a kind of circus-carnival feel, which matches perfectly! What a fun sketch for #101! 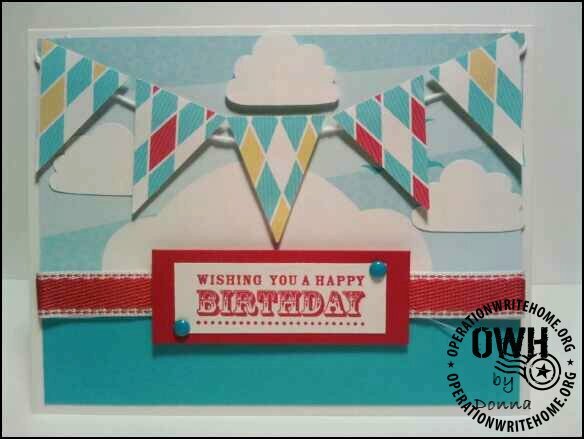 This is such a happy card….colorful design.My eye was drawn to the center pennant as it looks like an ice cream cone with the cloud on top:)) Will have to see what I can do with this one now.Thanks for the inspiration. Great sketch! Beautiful card Donna. Love the clouds and colors you used.